If you can’t eat regular gluten bread, you know that buying gluten-free from the store can be quite expensive. But there’s no reason to give up bread if that’s what you love. You should instead trying baking at home. You can start with store bought mixes first and once you become comfortable with making bread at home, you could experiment with various mix recipes to bring down the cost even further. Making gluten-free bread requires a different set of rules from the ones you use when making normal bread. Gluten free bread is denser and heavier but doesn’t bind as well because of the absence of gluten proteins. For this reason, gluten mixes should either contain Xanthum gum for the binding or the dough has to be kneaded thoroughly but quickly. Gum does make the dough stickier and sometimes difficult to work with. Make your gluten-free bread in any of these top rated bread machines or read our gluten free bread machine reviews below to sort through them and choose one to buy. We also do a detailed comparison of the best Zojirushi, Breville, Cuisinart and T-Fal bread machines, two of which are featured in this article. When making gluten free bread in a bread machine, it is better to have either two paddles or an extra large paddle to gather all bits of dough that tends to stick to the walls. If not, you’ll have to periodically scrape the walls with a spatula yourself. Dual blades also allow for a quick but higher rise on the dough. Gluten free dough should not be overworked or made to rise too much as the end product will be too dense and flat. Therefore, the best breadmaker for gluten free bread should ideally have a special gluten-free cycle where the kneading stage is shorter and there is just one rising stage before baking. Once done baking, remove the bread immediately to prevent it from becoming soggy due to the condensation. Of course, you can have more control over the entire process if you skip a bread machine entirely and use a heavy duty stand mixer that is especially good for tough dough. Then you can just put the formed dough in your oven to bake. Not only do you have a gluten free setting on the Zojirushi BB-PAC20, but you also have custom menu settings. If the pre-set function doesn’t give you bread to your liking, you can experiment with the settings until you do and then save the combination that gives you the best results. This bread machine not only tops our picks for gluten free, but it also makes our list of top rated overall. You can get a large 2 pound rectangular loaf of almost every kind of bread, cake or even jam, but what makes this the best bread machine for gluten free bread are the gluten free setting and the dual paddles for kneading. It also has a powerful motor that helps work through all the tough flours and the manual comes with 10 recipes just for these breads. For those who want to check or pause between stages, you can and you can also just use the quick cycle to have bread ready in 2 hrs if you’re in a hurry. A delay timer lets you have fresh bread in the morning too. Since this is not a cheap machine, it should be used regularly to get the best value out of it. If there are other members in the family that can eat gluten breads, that’s a good thing! Those who’ve used the gluten-free setting love how the bread turns out and say that it looks and tastes really great. Another plus is that it operates very quietly. For a less expensive option but still with dual blades, try the West Bend 41410. You can make from 1.5 pounds up to 2.5 pounds of bread in one of three horizontal sizes, choose crust color, and choose from any of 12 pre-programmed settings, including Gluten-free. Delay start and Keep warm are the other features here. In addition to the non-stick pan, blades, measuring cup and spoon and recipe manual, you also get a dough blade removal tool. The biggest difference you’ll notice is that unlike the Zojirushi, this unit is light, noisy and will vibrate a bit on your counter while working. At this price, however, that should not stop you as it is an excellent beginner’s model. This is the company that first recognized the need to make gluten-free bread making easier. With the Breadman TR2500BC breadmaker, you can do 3 vertical but rectangular loaf sizes from 1 pound to 2 pounds and you can choose crust colors. For a crisper crust, you can select the convection heating function. The pre-progammed settings allow for all kinds of bread, including gluten free and low carb. Other than bread, you can also make cake, pasta dough, pizza dough and jam. You can set it to bake up to 24 hours later and it has an automatic fruit and nut dispenser for timed adding to the dough. The slices that you get with the larger loaf setting may be too large for a regular toaster but if you can use the smaller setting if you intend to toast. While it uses a single paddle, the gluten-free setting still makes good bread. You may have to scrape the sides down once or twice with a spatula unless you don’t mind losing a bit of dough. This is the only machine that has more than one option for gluten-free bread. It actually has three! The T-fal PF311E ActiBread lets you make normal and sweet bread but also gluten-free cake. The included recipe booklet will tell you how to use these settings. You also get several other pre-programmed options like French bread, whole wheat and salt-free. Several of these also come with a “Rapid” function too. You can choose from three sizes of square loaves – 1, 2 or 3 pounds, and you can choose crust color too, although a couple customers say that the medium and dark settings make a very thick crust and you should stick to the light setting. You can delay the program to start up to 15 hours later and you can use a Keep Warm function at the end of baking. You may find it difficult to remove the paddle from the baked product, in which case you can use the included hook to dig it out with minimal damage. The Cuisinart CBK-100 was our pick for a machine that excels in kneading. For most types of breads, it allows you to use the machine only for kneading and rising before you remove the dough for baking in the oven. However, this function should not be used for gluten-free bread. There is a special program just for that and it can be used for the entire kneading, rising and baking process. You can also use the rapid cycle or select the pre-packaged yeast mix program. Choose from 3 loaf sizes – 1 to 2 lbs, 3 crusts and 12 menu settings. 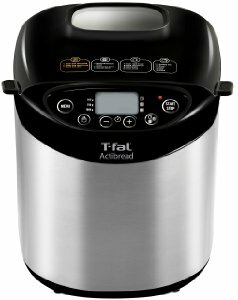 Those who have used the gluten free setting say that this is the best breadmaker for gluten free bread. This is another expensive option that you could consider if you plan to make a lot of bread. The Breville BBM800XL was one of our top picks for whole grain and wheat bread, but it also has a gluten-free feature that works well. Its paddle collapses before the final rise to minimize the hole in the bread and it includes an automatic fruit and nut dispenser. You can choose from 13 settings, 4 loaf sizes and 3 crust colors. While this may not be the best gluten free bread maker, it is one of the best overall, especially if you have a bread loving family with some gluten-tolerant members. It is also nice that you can make larger loaves than most with the 2.5LB maximum setting. While this inexpensive model does not have any fancy features, it does come with 12 menu settings, including one for bread without gluten. The Hamilton Beach Homebaker 29882 does this and other breads, cakes and jams well and is very easy to use since you don’t have to select from too many options. It does not alert you as to when baking starts, so if you want to remove the paddle before that, you have to keep an eye on the process or time the cycles once you know how long each stage takes. It was our pick for the best bread machine for under $100. ← What is the Best Toaster Oven under $100?